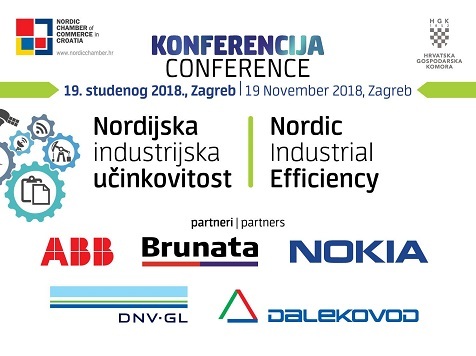 Nordic Chamber of Commerce in cooperation with Croatian Chamber of Economy, is organizing Conference „Nordic Industrial Efficiency“ on Monday 19 November 2018 in Zagreb. The topic of the Conference is smart and efficient solutions in the field of automation, digitization and smart systems for smart energy utilization. Representatives of eminent Nordic and Croatian companies (ABB, Brunata, Dalekovod, DNV GL and Nokia) will present their knowledge, expertise and good practice, based on real case examples and top achievements, including latest technologies and solutions that contribute to more efficient industry development and a sustainable economy as a whole. One of the goals of the Conference is to establish a dialogue, stimulate exchange of experience and know-how, including creation of new valuable business contacts and successful co-operation between representatives of Croatian and Nordic business communities. Furthermore, the CCE Digital Chamber, as well EU funds, that are available for business improvement projects in mentioned sectors, will also be presented.